VINLAND — Dave McFarlane has worked for himself most of his life. But there was a brief period when he didn’t, and it made a big impression. “I worked once, for a short time before I was married, for a refrigerator company,” said McFarlane. “I was on the line helping assemble refrigerators. “I think I lasted four days. Humans, he decided, were not designed to work like machines — or trained monkeys. Today, as president of McFarlane Aviation Products, McFarlane has established respect for his employees and the dignity of the human person as bedrock principles of his company. “I believe in the Christian principles of treating all people with respect and helping anybody if it’s possible,” he said. The roots of McFarlane Aviation, Products can be traced all the way back to McFarlane’s boyhood in Arlington, Iowa, whose population today is about 500. When McFarlane was 16 and his brother Claude was 15, their father gave them the Texaco station. The two boys took turns holding down the fort while the other was at supper or afterschool activities. They did homework between tasks. They even hired some of their friends. About this time, McFarlane took flying lessons. He’d been smitten with the romance of flight since he’d begun building model airplanes as a little boy. When he went to community college, McFarlane used his self-taught car body repair and painting skills to paint aircraft as a part-time job at night. He didn’t finish college, but went on to a series of jobs in aviation, including crop-dusting. He founded McFarlane Aviation in 1970. He met his wife at his sister’s wedding, and he and Phylis were married in 1973. Today, they’re members of Annunciation Parish in nearby Baldwin. 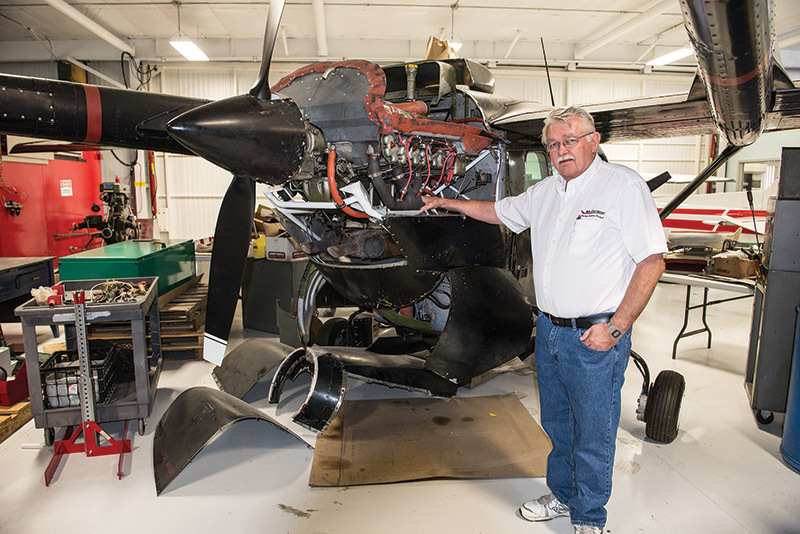 The McFarlanes brought their aircraft repair and crop-spraying business to Kansas in 1978, when they bought the Vinland Airport, located 10 miles southeast of Lawrence. It occurred to McFarlane that many of the parts he was installing could be better — and cheaper. He incorporated his business as McFarlane Aviation, Inc., in 1986, and began to manufacture parts for small aircraft. Manufacturing aftermarket replacement parts for small aircraft became the company’s sole focus after 1993. Now, the company is McFarlane Aviation Products. Its 75,000-square-foot factory is at the Vinland Airport. Two people who have come to know Dave and Phylis McFarlane over the years are fellow Annunciation parishioners Dave and Nancy Kronoshek. The McFarlanes are difficult to pick out in the pews because they are so modest. They’re involved in the parish — Phylis on the finance committee, and Dave grilling burgers at the parish booth during the annual Maple Leaf Festival. Kronoshek took a tour of the factory and was impressed not only by the plant, but with the 80-person workforce. “They’re loyal to him because he’s loyal to them,” he said. McFarlane has good basic benefits but, over and above, he has others that are quite uncommon. For example, the company owns three airplanes and subsidizes employee flying lessons. About 15 to 20 employees are pilots. In addition to their sick and vacation time, McFarlane adds another free week without pay. Employees can give their sick time to another employee. The company also has a flexible time policy, so an employee can work early or late — if possible — should they need to be absent to take care of family matters. The company also has a profit-sharing plan. Employees also get a bonus on the anniversary of their employment date. McFarlane’s approach is based both on altruism and practicality. Simply put, company policy is the Golden Rule. “The basis of our policies toward our employees is to treat them the way we’d like to be treated,” said McFarlane.